With the power of the hydraulic press still a couple of days from securing, I will be starting with some of the smaller blooms / bloom fragments. Those are small enough to work with hand power - or under the smaller die size of my air hammer. The overall lines of these possible pieces actually comes from Bronze Age Greece. The artifacts are small one piece general purpose knives, with blades about 4 inches long. In terms of the profile, I thought to change the proportions to create a very wide and stubby blade, but retain the sweeping curves. This is a general profile I have worked with many times before - and have had great results. 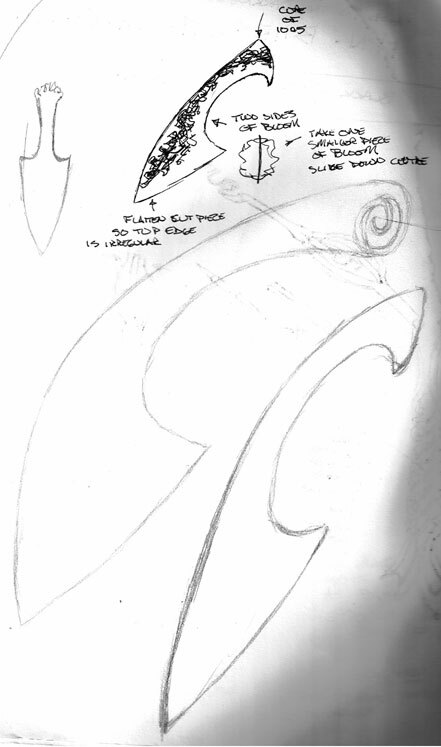 The concept is to take one of the smaller bloom fragments, perhaps one of the cut sections. That would give me a piece with one more or less flat, and relatively dense surface. This I would flatten slightly, then cut in two down the centre of the flat side. The result of this should be two pieces, each of which will have a wide flat side plus a relatively flat edge. The opposite edge should retain the irregular surface originally on the outside of the bloom. These two slabs would then be welded on to a separate core piece of a middle carbon spring steel, a bit wider than the bloom pieces. If the correct sizes are matched, what should result is one more or less 'clean and tight' edge, and one ragged edge. The two surfaces of the block would be hard and dense along one side, but become irregular to the other side. 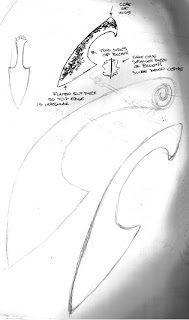 This I would then forge up into the finished blade profile. On polishing, what should result is a hard and even bottom edge. When ground, the bevel shape created will expose the harder carbon steel core for the cutting blade. Along the back, the material should appear pitted and irregular - a feature from the bloom iron source of the material.